Da war ich seit Jahren mal wieder auf Schloss Neuschwanstein, bewaffnet mit meiner Spiegelreflexkamera und dem Wissen um einige tolle Georgsbilder am Hofe König Ludwig des II. Leider schien irgendwo jemand einen Regentanz aufgeführt zu haben und das auch noch sehr erfolgreich. Trotz Regenjacke, Wasser abweisender Hose und hoher Stiefel war ich binnen kürzester Zeit nass, die Stimmung sank zu den in den Schuhen quietschenden Zehen und dort froren sie so vor sich hin. Natürlich sah ich nun davon ab die Wandgemälde an den Außenmauern zu fotografieren, denn gesehen hätte ich sie eh nicht. Schade – tolle St. Georgsbilder und Figuren hätten dort gewartet. Besser wurde es für die 12€ schwere Eintrittskarte im Innenraum leider kaum, denn dort durfte man – richtig geraten – nicht knippsen. Na gut, ich habe es, in unbeobachteten Momentan dennoch versucht. Ohne Blitz und in schlecht beleuchteten Räumen sind die Ergebnisse nicht so wie ich sie mir erträumt habe, aber immerhin befriedigte diese kleine Rebellion meine knurrende Laune. Wieder zu Hause versuche ich nun bessere Versionen der von mir geschossenen Bilder im Internet zu finden. Irgendwer wird bestimmt mehr Erfolg gehabt haben. Vom hier links abgebildeten Bild gibt es tausende von Varianten im Netz. Es hängt im großen Thronsaal König Ludwigs II. und zeigt die Drachentöter Szene St. Georgs und oben links eine kleine Burg, welche die vierte, niemals erbaute Burg des Monarchen hätte darstellen sollen, wenn er sein Leben nicht frühzeitig beendet hätte. Ein zweites Bild zeigt eine Szene aus der Nibelungensage. 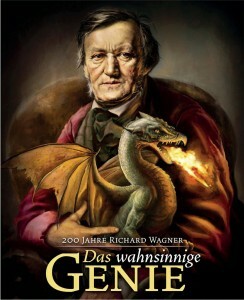 Da alle Kunstwerke der Burg thematisch eng an Opern Richard Wagners angelehnt sind, können es demnach nur Siegfried und Fafnir sein, die sich da in Gold auf dem Gang vor des Königs Schlafgemach postiert haben, oder? Abgesehen davon, dass sich solch eine Statue in meinem Wohnzimmer auch ganz toll machen würde, habe ich leider kein gutes Foto im Internet finden können. Hilfe?! Da laufen täglich geschätzte 2000 Leute mit bestimmt doppelt so vielen Kameras durch das Schloss und niemand hat diese Statue mal ordentlich ablichten können? Skandal! Wie dem auch sei, Neuschwanstein ist mit Sicherheit einen Besuch wert und hoffentlich finde ich noch ein bessere Bilder. A team of six British zoologists, including a computer expert, photographer and an engineer, have ended a two-week long research on dragon (locally called ‚Ninkinanka‘) in The Gambia. Speaking to the Daily Observer, Mr Chris Moiser, a Zoologist at the Parfell Animal Land (Zoo) Caracals, said they have also conducted research on a lizard, locally known as Armitage’s King, which was founded in 1922, by the then Governor of The Gambia, Governor Ch-Armitage (1920-1927). According to Mr Moiser, the research had given them the opportunity to meet several people, especially in Kiang West, where "we met people whose relatives had once seen a dragon". He described various stories about the dragon as interesting, and then narrated: "At Kiang West, we were told that a ‚Ninkinanka‘ was seen about 10 to 15 years ago, with a range of 15 meters long. "We talked to many people in the area who had grand parents, some of whom were fortunate to see ‚Ninkinanka‘, but they said they are afraid of it. It is still a belief that if a Black man sees a ‚Ninkinanka‘, he or she will die but cannot kill a White man", he said. Chris Moiser opined that their research gathered facts, confirming the existence of ‚Ninkinanka‘ in The Gambia. "The animal is in The Gambia but we are yet to see one. We will do all our best to ensure that we get the full story of the ‚Ninkinanka‘. "Many people assured us that in areas, such as Foto Jallon Island, ‚Ninkinanka‘ could be found there. We will ensure that we are well-equipped next time we come around," he noted. Other team members include Richard Freeman, a zoologist, Lisa Dasley, a photographer, Dr Chris Clark, an engineer, Seizi Marsh, a computer expert, and Olly Lewis, an ecologist. A team of UK dragon-hunters is on an expedition in The Gambia to track down a mysterious creature known locally as the "Ninki-nanka". Believed to live in swamps, the ninki-nanka appears in the folklore of many parts of West Africa. It is described as having a horse-like face, a long body with mirror-like scales and a crest of skin on its head. Team leader Richard Freeman told the BBC, evidence so far was sketchy as most people died soon after seeing it. Mr Freeman, a cryptozoologist from the UK-based Centre for Fortean Zoology, admitted that the ninki-nanka’s existence was "very far-fetched indeed". Second-hand accounts varied wildly from it looking like a crocodile or a snake to having wings and spitting fire, he said. But he disputed a suggestion that the hunt was a waste of time and money. "We didn’t know any of this before we came. We have to look into everything to see if there is a possibility that there’s a real creature there," he told the BBC’s Focus on Africa programme. Cryptozoology is the search for animals whose existence is disputed or unsubstantiated, such as the Loch Ness monster. The team have interviewed one eyewitness so far – a park ranger from the Kiang West National Park who lived to tell the tale of his encounter three years ago. He described an immense animal 50 metres long by one metre wide that he watched for more than an hour before being taken ill. He put down his survival down to a herbal potion given to him by an Islamic holy man, Mr Freeman said. Later, according to the expedition’s blog, after being shown pictures of various reptiles and mythical animals, the ranger said the creature’s face most resembled that of a Chinese dragon. "We’ve heard very similar stories all over The Gambia but mostly not first hand eyewitnesses… there seems to be this thing when you see the ninki-nanka you will die usually within a few weeks," Mr Freeman said. The team are taking back a sample of what is claimed to be a ninki-nanka’s scale to be tested in the UK. But initially investigations suggestion this is a red herring, perhaps a bit of rotten celluloid film and "not biological". "We haven’t discounted the possibility that there is a flesh and blood ninki-nanka in the swamps of West Africa, it’s just at the moment the evidence is pointing to something more folkloric," he said. At about 6 p.m. on August 6, two students walked out of their library in Jilin University and looked up. “Look! 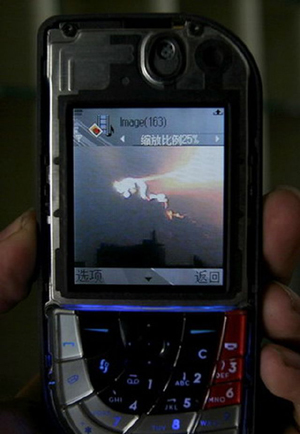 A flying dragon appears in the sky!” A student named Li captured an image of the dragon on his picture-phone, providing the second instance of photo documentation of a dragon flying over China so far this summer. “When I was walking out of the library, I saw a bright, animal-shaped object flying in the sky, heading southeast. It was incredibly dazzling, just like a gigantic dragon. I immediately took a picture of this unusual event on my cellphone,” said excitedly Li, a student at Jilin University, Jilin province. Li captured what he believes to be a dragon on his phone camera and began passing it around the University two days later. In the middle of the photo is a distant-looking dragon-shaped object, complete with four limbs and a tail. As they were leaving the library that evening, Li’s girlfriend Xiaobin suddenly yelled, “Look! A flying dragon appears in the sky!” A glowing, red dragon-shaped flying object streaked across the sky, illuminating the evening sky just after the sun had disappeared from sight. Li estimates the object to have been over ten meters long. It was at the altitude of an airplane but was much bigger and flying very fast. At first the flying object radiated a low metallic light. It then became more and more dazzling over the next two minutes before it disappeared into the southeast. “Seeing the flying object, I instantly took out my cellphone and captured its picture,” Li said emotionally. Was it really a dragon? One staff member from a nearby observatory says nothing unusual was observed that night. He says that he cannot confirm the sighting because he did not see it himself and not find out relevant documentation. PAOLO FRIL, chairman and chief scientific officer of GeneDupe, based in San Melito, California, is a man with a dream. That dream is a dragon in every home. GeneDupe’s business is biotech pets. Not for Dr Fril, though, the mundane cloning of dead moggies and pooches. He plans a range of entirely new animals—or, rather, of really quite old animals, with the twist that even when they did exist, it was only in the imagination. Making a mythical creature real is not easy. But GeneDupe’s team of biologists and computer scientists reckon they are equal to the task. Their secret is a new field, which they call “virtual cell biology”. Biology and computing have a lot in common, since both are about processing information—in one case electronic; in the other, biochemical. Virtual cell biology aspires to make a software model of a cell that is accurate in every biochemical detail. That is possible because all animal cells use the same parts list—mitochondria for energy processing, the endoplasmic reticulum for making proteins, Golgi body for protein assembly, and so on. Armed with their virtual cell, GeneDupe’s scientists can customise the result so that it belongs to a particular species, by loading it with a virtual copy of that animal’s genome. Then, if the cell is also loaded with the right virtual molecules, it will behave like a fertilised egg, and start dividing and developing—first into an embryo, and ultimately into an adult. Because this “growth” is going on in a computer, it happens fast. Passing from egg to adult in one of GeneDupe’s enormous Mythmaker computers takes less than a minute. And it is here that Charles Darwin gets a look in. With such a short generation time, GeneDupe’s scientists can add a little evolution to their products. Each computer starts with a search image (dragon, unicorn, gryphon, etc), and the genome of the real animal most closely resembling it (a lizard for the dragon, a horse for the unicorn and, most taxingly, the spliced genomes of a lion and an eagle for the gryphon). The virtual genomes of these real animals are then tweaked by random electronic mutations. When they have matured, the virtual adults most closely resembling the targets are picked and cross-bred, while the others are culled. Using this rapid evolutionary process, GeneDupe’s scientists have arrived at genomes for a range of mythological creatures—in a computer, at least. The next stage, on which they are just embarking, is to do it for real. This involves synthesising, with actual DNA, the genetic material that the computer models predict will produce the mythical creatures. The synthetic DNA is then inserted into a cell that has had its natural nucleus removed. 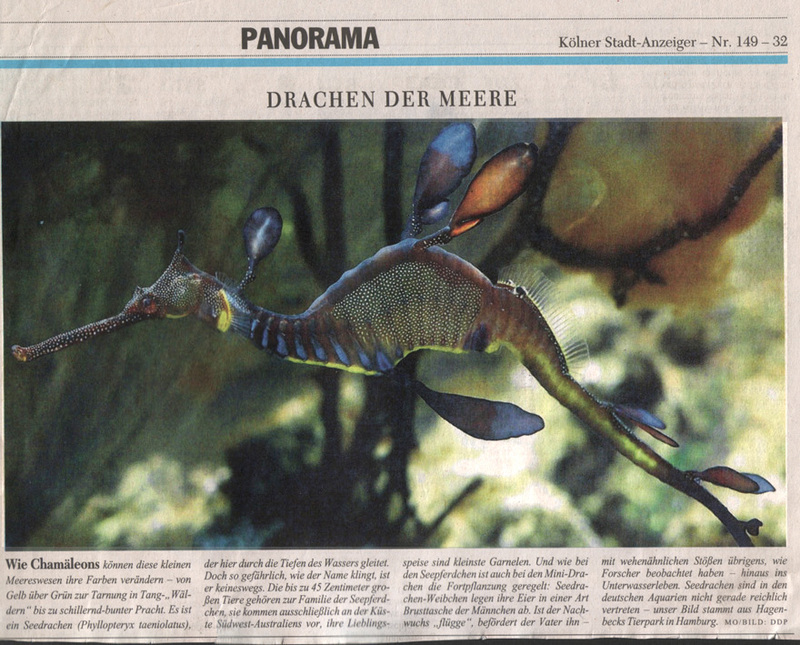 The result, Dr Fril and his commercial backers hope, will be a real live dragon, unicorn or what have you. Readers with long memories may recall GeneDupe’s previous attempt to break into the pet market, the Real Goldfish. This animal was genetically engineered to deposit gold in its skin cells, for that truly million-dollar look. Unfortunately Dr Fril, a biologist, neglected to think about the physics involved. The fish, weighed down by one of the heaviest metals in existence, sank like a stone, as did the project. He is more confident about his new idea, though. Indeed, if he can get the dragons‘ respiration correct, he thinks they will set the world on fire. "Im August 2005 veröffentlichte die Sternwarte Gemini ein Bild, das einem „himmlischen Drachen“ gleicht. Zu sehen ist ein Teil einer großen Sterne bildenden Region im Süden des Sternbildes Schütze. Diese liegt weniger als einen Grad von der bekannten „Lagoon Nebula“ und einige 5.000 Lichtjahre vom Mittelpunkt des Milchstraßensystems entfernt. Die dunkle Struktur, die an einen chinesischen Drachen erinnert, rührt von kaltem Nebel her, der im Hintergrund Kohlenwasserstoffgas absorbiert. Die Aufnahme erfolgte mit einem Gemini-Multi-Objekt-Spektrogramm (GMOS) während des ersten Halbjahres 2005." China ist die Heimat von Legenden, die von chinesischen Drachen handeln. Die Chinesen vor Tausenden von Jahren haben sich selbst als Abkömmlinge von Drachen betrachtet. Es existiert die Legende von einem chinesischen König, der ein Blutsverwandter eines chinesischen Drachens gewesen sein soll." Den „Biographien der chinesischen Könige und Kaiser“ zufolge, lebte Kaiser Yan, auch bekannt unter dem Namen Shennong, vor 5.000 Jahren und brachte den Chinesen den Ackerbau bei. Shennong heißt soviel wie „göttlicher Bauer“. Seine Mutter wurde Rensi genannt. Sie war eine Königstochter und die Frau von Shaodian. Als sie eines Tages einen Ausflug nach Huayang machten, sah sie einen chinesischen Drachen, der über ihrem Kopf flog. Unmittelbar darauf fühlte sie ein wachsendes Lebensgefühl in ihrem Leib. Als sie von der Reise zurückkam, gebar sie Shennong. Das „Bergsee-Sutra“ gehört zu den berühmtesten Mythologien des alten Chinas. Darin wird die Geschichte eines großen Kampfes geschildert, in dem der Barbar Chi You den Drachen Ying — der die Obhut über das Wasser hatte — beauftragte, ein Unwetter über das Land Jizhou zu bringen, um den dortigen Nebel abzuwehren. Als der mächtige Gottkaiser Huang Di der Qin-Dynastie den Thron bestieg, gesellte sich ein blauer Drache zu ihm und kniete vor ihm nieder. In dem ersten systematischen chinesischen historischen Text: „Die Aufzeichnungen der großen Geschichtsschreiber“ von Sima Qian kam ebenfalls ein Drache vor. Er nahm Huang Di, als dieser seine Kultivierung auf der Erde abgeschlossen hatte, auf seinen Rücken und flog mit ihm in den Himmel. Als Huang Di auf den Drachen stieg, versuchten 70 seiner Gegenstände, die aber kein Teil von ihm sein wollten, ebenfalls auf den Drachen zu gelangen. Manche von ihnen wollten nach den Drachenhaaren greifen. Doch der Drache schüttelte alle diese Gegenstände von sich. Sie schauten mit Tränen nach, als Huang Di mit dem Drachen in den Himmel emporstieg. Was im Meer tatsächlich so alles keucht und fleucht wissen die Wenigsten. Der Kölner Stadt-Anzeiger hat hier einen kleinen Artikel über „Drachen der Meere“ veröffentlicht, eine Abart der Seepferdchen. Sehr niedlich! Einem Artikel der "The Epoch Times" zufolge wurden während eines Überfluges des Himalayas zwei Photos geschossen, auf denen sich Drachen zu sehen sind. speien Feuer, haben Furcht erregende Zähne und sind nahezu unbesiegbar. "The dragon was evolved along with civilization itself" (Smith 1919: 76). "The artefacts of culture can be understood as defense systems that help to create the illusion that we are greater and more powerful than we actually are"
Writing about and reflecting upon the dragon has become an ongoing venture for me since I decided to choose it as the object of my presentation at the Milano conference on corporate artifacts in 1987. Once I had allowed this creature to enter into my mind and given it some space in my office it somehow began to crawl all over the place; dragons eventually were everywhere, in cartoons, in fairy-tales, legends, in advertisements, in churches, in mythology, in children books. And the more I let my friends know what a curious creature I had in my mind I received post-cards, newspaper articles and even a record with the famous song from Peter, Paul and Mary: ‚Puff, the magic dragon‘. It is the story of little Jackie Paper who shared part of his childhood with Puff, the gigantic dragon, till he eventually left the dragon when it made way for other toys. No later than when I first had listened to this song, I decided to play it at the beginning of my presentation which I was going to prepare. But when I did so it happened that the sound of the small tape recorder was by far not loud enough for the auditorium. Then, to my big surprise, when I nearly had switched the music off, the people in the room suddenly began to sing the song of Puff, the magic dragon; first softly as if they didn’t dare to trust themselves and then, the more they began to enjoy it, rather loud. Can you imagine, some hundred colleagues gathered in an auditorium of a famous Catholic University singing a song about the dragon like children ? There it was, in the middle of the audience, the dragon! The more I allowed the dragon to enter into my space the more I made the experience that this creature allowed me to cross boundaries, time boundaries as well as cultural ones. Not only that I rediscovered that previously in my life, as a boy-scout, there had been a time in which the dragon already had quite some significance for me as I identified myself with St. George, the hero. Very soon it also became obvious to me that the dragon not only is as old as mankind but more or less a universal creature which, despite its various meanings, can be found in nearly all cultures. Like the chimera, the centaur or the sphynx the dragon is a creature of the imagination. The question whether such an imaginary creature will be regarded as unreal or as real soon leads one into deeper areas of philosophy and of epistemology, in particular. Although at present there can be no doubt that the dragon is an artifact, created and brought into life through art, during previous millenia it often had the same reality as gods, angels, devils, ghosts, fairies and other beings. Today we may be convinced that there is no such a thing as a dragon and that dragons never really existed, but nevertheless we are surrounded by countless symbolic representations which prove that there were times in which our predecessors considered dragons to be as real as either the particular hero who attempted to kill it or the horse he rode upon. Overtime, the more I tried to take the dragon seriously the more I became confused with images and perceptions, previously taken for granted, of what reality was supposed to be. If, for example, according to contemporary Christian belief of the existence of God, the saints and the angels is supposed to be real but not the existence of the great red dragon with seven heads and ten horns which is described in the Revelation of John (cf. Rosenberg 1956: 207 ff. ), what are then the ‚criteria‘ to discriminate the real from the unreal? Similar is the case of St. George whose historic existence eventually was negated by the church. What about all the good works which have been accomplished by thousands of Christians for his glory; are they less real after the annihilation of this saint? And if, on the other hand, the dragon will be regarded as a symbolization of a part of human reality which otherwise cannot be grasped or described, what then is that reality about? Is it a real reality, an unreal or even a false one? Since then the dragon has become the ‚logo‘ of this network of social scientists, an autonomous work-group within EGOS, the European Group of Organization Studies; from 1985 to 1987 Dragon was the title of the journal of SCOS. At the same time my wish to become more concerned with the dragon was guided by the ’slogan‘ of SCOS: "We do it for fun!" And as a matter of fact quite some fun it was both searching for dragons as well as presenting part of my results on the occasion of the Milano conference. It seems that what I came up with out of this particular search is twofold: It is a piece of research on the logo of a pa rt icular organization, but it also is the expression of how an organization member acts within the process of intersubjective constructions of reality and its meaning. As I cannot hide that I am a member of this pa rt icular institution the following results and reflections may also show how a pa rt icular SCOS-member used his own impact and authority to explain and describe what appears to him as a pursuable interpretation of organizational reality. As in any other organization such an individual interpretation seldom is a solipsistic one; it normally is rooted in the institutional histo ry and tradition and related to other members representing as such either a mainstream approach of thinking or a more deviant one. myth in which "the hero fights a struggle against a reality which is different from what he wants it to be… Reminding one of that fairy-tale written down by the Grimm brothers of the young man who travelled into the world in order to learn what horror was, at the beginning of SCOS some young and daring scholars went into academia not to fight the dragon, but to find him. 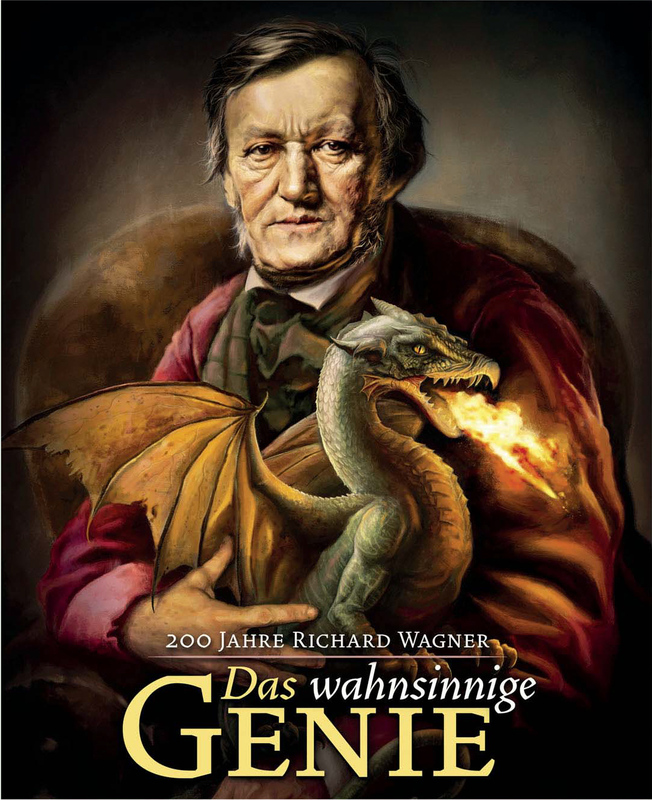 Researching the dragon they enacted a revaluing of values (an ‚Umwertung aller Werte‘ – a paradigm change), because they tried to use the treasure of rationality, of choice, of consciousness as an instrument for finding the dragon. On the road to the dragon-country, the promised land of life and understanding, we made some friends and met quite a few fellow-travellers …. One interpretation of the ways of SCOS is that of a religious quest, in search of the truth of organization life". The dragon belongs to the wider family of snakes and serpents, as such it is much older than mankind. Contrary to men, dragons are creatures of chaos (Redaktion … 1985: 13). As can be learned from various accounts of the creation of the world, dragons have existed since the first days of the genesis. Dragons are born from eggs which usually have the size of two man’s fists. Especially during infancy their predominant living space is water; different species prefer lakes, swamps, rivers, or the seaside. At least for the Chinese version of the dragon it can be proved that dragons take about 1500 years to grow up to their full length, another 500 years till their characteristic horns develop and again another 1000 years till their wings are formed (Redaktion … 1985: 44). Descriptions of dragons were seldom accurate, because those who happened to meet a dragon were so scared that they could only remember one or the other of its horrible parts without any further perception of its gestalt (Redaktion … 1985: 95). Although it seems to be true that no one dragon equals the other (Mode 1983: 120), dragons predominantly consist of the following elements: the jawbones of a crocodile, the teeth of a lion, the wings of a bat, the legs of a lizard, the claws of an eagle, the body of a python and the horns of a bull (Redaktion … 1985: 14). Dragons are disseminated all over the world; detailed maps prove, for example, the dragon places in Middle Europe (Redaktion … 1985: 78 f.; Vinycomb 1906: 79 ff.). As Dickinson (1981: 75), for instance, indicates, there are at least 60 places in Europe which derive their names from the dragon, such as Drakenburg (Dragonburgh), Wurmlingen (named after a big worm which was the original Germanic word for dragon, as in Lindwurm) or Klagenfurt (a town in Austria which derives its name from the wailing which was heard when the town was destroyed by a dragon, a tragedy which is depicted by the huge monument in the town center). From their historical evolution dragons can be classified into two main categories: the cosmic and the mythological dragons; the latter are often then subdivided into modern and psychic ones. Cosmic dragons cannot be regarded as animals in the literal sense, they were incarnations of the chaos, they are direct descendents of the Titanes who lived before time. Contrary to their predecessors the modern mythodragons were natural creatures; they housed in caverns and canyons, curled around mountains and ancient mounds, leaving behind them stink and slime; they crawled through the woods and mixed with the ghosts of sources and rivers (Redaktion … 1985: 76). The psychic mythodragons, which seem to be the most interesting ones in the context of the symbolics of artifacts are inhabitants of the human inner world. As they often cannot be acknowledged as such, they have to be projected into objects of the outer world (Steffen 1984: 7). – It seems to me that post-modern mythodragons can be neglected so far because they only are allusions to certain elements deriving from ancient styles. Whereas the proof of the dragon’s existence is more a matter for scientists or researchers, the question of how to handle a dragon leads us into the fields of scholars. As Cooper states, "the scholar cultivates the critical spirit of the ‚humanistic sciences’" (Cooper 1983: 721) which "answer the central question of men’s collective existence and of individual life history. Their themes are justice and freedom, violence and oppression, happiness and gratification, poverty, illness, and death. Their categories are victory and defeat, love and hate, salvation and damnation" (Habermas 1971: 96). 1. The heroic way: "You have to kill him!" 2. The magic solution: "Kiss him!" 3. The Chinese version: "It is the emperor of wisdom and rain!" 4. The science fiction approach: "Ride him!" 5. The lonely child solution: "Let’s be friends!" Out of these five versions, the heroic solution of killing the dragon obviously is the predominant one in our western tradition. The magic creators of the SCOS logo around P. O. Berg have deliberately not chosen the image of the knight fighting the dragon because that would have given "too much power to the knight as being a symbol of the victory of the modern technocratic society over the primitive and instinctive dimensions of life" (Berg 1987a). Another, obviously unconscious reason for their choice could have been that e.g. the image of St. George would have been too reminiscent of the Order of the Garter which then probably would have been in collusion with SCOS‘ predominant myth of an open network. Although I favour such a creative attempt at organizational mythmaking, it appears to be important to elucidate a bit further the image of the dragon fight which as such is as old as mankind. 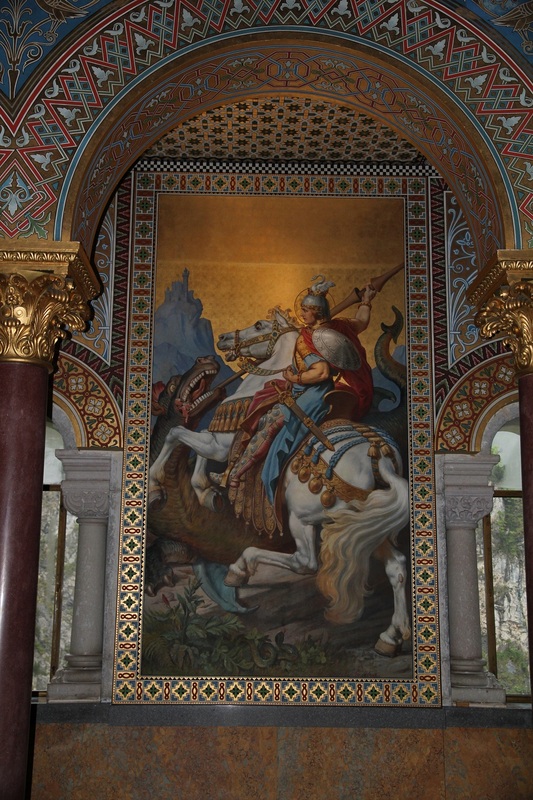 The legend of St. George seems to be a good example to begin with because the history of his relation to the dragon not only has a relatively clear origin but also a significant relevance as a symbol of many European nations. As he was the patron saint of all those who had devoted their lives to fighting, St. George was also the patron of the crusaders. They obviously were the ones who brought the image of St. George as the dragon fighter back. 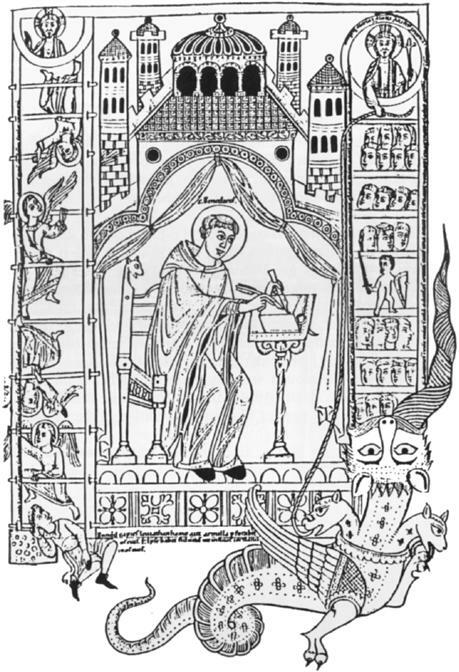 It then ultimately became a constituent part of his iconography through Jacobus de Voragine a dominican and archbishop of Genua, who, in the 13. century, included this legend into his ‚Legenda Aurea‘ (Golden Legend) which was of great influence on folkloristic piety (Braunfels-Esche 1976: 21 ff. ; Egli 1982: 223 ff.). Although St.George did not officially become the national patron of England until 1347, his feast, the 23rd of April, received the same rank as the great feasts of the ecclesiastical year through a synod at Oxford in 1222. Around that time he also became the national patron of Georgia, Greece, Russia, Hungary, Poland and Sweden; in Germany he was the patron of the nobility. That the dragon became the incarnation of evil, the enemy and often enough the devil in Christian mythology during the last millenium not only became evident through thousands of churches which were dedicated to St. George all over Europe but also through the fact that the legends of nearly 60 saints are based, one way or the other, on dragon killing (Aufhauser 1911: 239); among them are also women who like St. Martha vanquished the dragon with holy water or St. Margaretha who became the patron of pregnant women, because, when she was swallowed by the dragon, the cross which she was wearing grew till it finally burst the monster (Redaktion … 1985: 95; cf. Roheim 1972: 299). That the dragon also has a long tradition in our western military history is, for example, indicated by the ‚dragons‘, the French cavalrymen in the Thirty Years War, who were equipped with small-arms called ‚fire-spitting dragons‘; it seems that the fact that, for example, the English, French, German, and the Swedish language have incorporated the Latin ‚draco‘ (which was taken from the Greek ‚drakon‘), originates from the dragon as a cohort sign of the Romans which they themselves had adopted from their Teutonic enemies (Höfler 1961: 99). The self-identification with the dragon in order to put one’s enemies to flight is in itself a symbolic act which e.g. can be found among the ancient Persians, who wore dragon helmets, or among the Vikings, whose ship bows were shaped like a dragon, a symbol which was later put on the church roof as protection against the demons. "In the sign of the dragon they were conquering the dragon" (Steffen 1984: 30). In addition to St. George some further names and images may indicate how primeval and universal the heroic way of coping with a dragon is. There is, for example, the mythical story of the nordic hero Sigurd who when he killed the dragon on behalf of a dwarf realized only by chance that one single drop of the dragon’s blood gave man the knowledge about the primeval things on earth. One also may be reminded what happened to Siegfried, his Germanic namesake, who took a bath in the dragon’s blood in order to get the strength of the dragon himself. The epos of Beowulf and Wiglaf (Redaktion … 1985: 7 ff.) 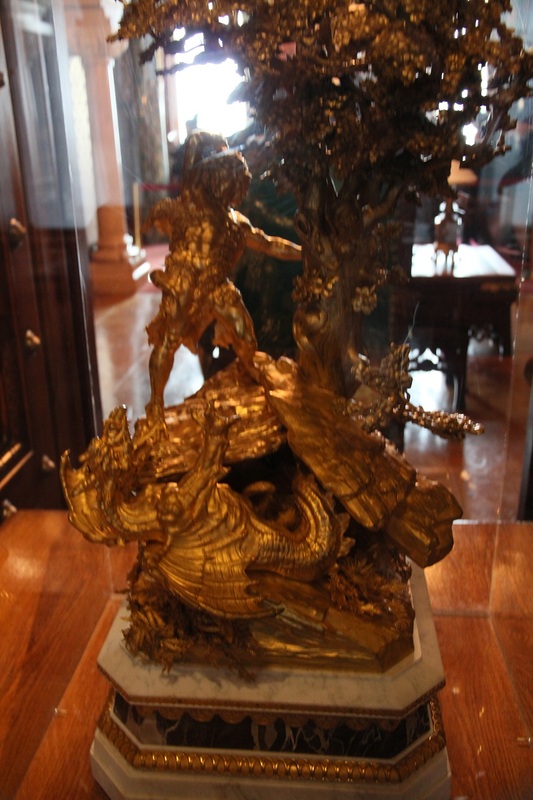 or that of the Golden Fleece are other examples that the dragon had to be slaughtered in order to receive the enormous treasure which he kept in custody. Ancient Egyptian mythology contains a further image of the dragon fight. It is the sun-god Re who accompanied by his hyena faced guard Seth moved across the Egyptian sky in his shining barque, keeping away the dragon Apep who reigned over darkness striving to annihilate the god of light. Out of all the stories and legends on dragon fighting I, however, prefer most the one of Sire Eglamour and Lady Chrytobel, two French lovers who had to suffer long and painfully because of their affection (Time-Life 1987: 128 ff.). Like the ancient hero Hercules, Eglamour had to accomplish a variety of works before he was allowed to marry Chrytobel. Before the hero had come back from the dragon fight his love expected a child from him. And as her father had decided to kill her together with the infant she escaped into the magic empire. It was a long odyssee till Eglamour and Chrytobel eventually became united again; it was only after Eglamour unknowingly had fought his own son, thus preventing him, like the ancient Oedipus, from marrying his own mother, that the double marriage of Eglamour and Chrytobel as well as their son and his wife could be celebrated in the far Orient. That a woman or a virgin is part of the dragon fight myth, as in St. George’s legend or in fairy tales (Rank 1922), is also a constituent dimension of many of the dragon images of ancient Greek mythology. There is, for instance, the Greek god of light, Apollo, a son of Zeus, who killed Python, the dragon who had tried to kill Apollo’s mother Leto (Steffen 1984: 44). Perseus, another son of Zeus (together with Danae), fought the dragon at the seashore of the red sea and thus gained Andromeda as his wife (Redaktion … 1985: 120 f.; Egli 1982: 218 f.), akin to Cadmus, a hero from Thebes, who liberated Harmonia, a double of Aphrodite, by slaying the dragon (Roheim 1972: 301). And most famous of all is the myth of Amor and Psyche. Amor, the son of Venus and Jupiter, liberated Psyche, the king’s daughter, who, chained to the rocks, for the monster. He hurt himself with one of his arrows. Thus he fell in love with her in order to save her. In my attempt to understand especially these latter myths of the dragon fight I found a contribution which Roheim (1972: 297 ff.) made, quite challenging. As this author demonstrates a variety of connections between the ancient Apollo myth and that of Cadmus, it becomes evident that both these dragon- or serpent-slayers are serpents themselves. From such a reading of these myths it becomes evident that "Apollo or Cadmus, the young serpent, killed the old serpent at springtime and married the old serpent’s daughter" (Roheim 1972: 307). As such "the idea of death (is) associated with that of a new life" (ibid. : 304); thus the dragon or the serpent turns into a symbol of fertility and initiation (cf. Drewermann 1984: 397 ff.). – From another psychoanalytic perspective, i.e. from the Jungian tradition, Erich Neumann (1953: 83, 162), makes the point that the serpent or the dragon represents the archetype of the ‚great mother‘ which has to be conquered in adolescence in order to integrate the anima. Whereas the serpent or the dragon in these ancient myths, no matter whether they were Greek, Egyptian or Judaic, originally symbolized the relation between man and his cosmos or the universe, it seems that particularly in the legends about various saints since the Middle Ages the dragon became a container for the often unconscious anxieties related to sexuality, marriage and the loss of virginity. What originally had been a symbol of mankind was more and more converted into an episode of certain individuals. As such the dragon also became a symbol of the pleasure of the flesh and lasciviousness which then had to be projected by men into women. I am quite aware that what I have stated so far about the dragon fight as the predominant mythological way of coping with a dragon has to be left as nothing more than a brief sketch. Before I try to refer to the SCOS-dragon I would like to offer at least some further imaginations of how to cope with a dragon. The above mentioned magic solution is a proof that the relationship among virgins and dragons was more complex than just being a city’s sacrifice to prevent the annihilation of the town through the monster. Some women, who had fairy-like magic power, kept these monstrous creatures as slaves in order to use their strength for bad purposes or just to tame these beasts (Redaktion … 1985: 83). The Russian scorceress Marina in the palace of Kiew used to seduce the dragon fighters and turned them into harmless magpies, pigs or oxen. The French ghost-lady Succube rode a dragon and seduced her young adventurers through vampire-like kisses which ultimately made them die. As Neumann (1953: 121 f.) states it, the image of the madonna standing on the dragon is a symbol of the wholeness of the female self; in its Christian version it has been converted into the virgin (Maria), who tramples the head of the serpent. The Chinese version of the dragon, however, has quite a different mythological connotation than the traditional western one. Akin to the western dragons the Chinese dragons are of cosmic origin but they were much more the friends of the mortals. As the dragon represented ultimate wisdom and was the source of blessings, he became the symbol of the emperor who thus was regarded as a descendant of the dragons. The dragons were the masters of the rain; they often had god-like qualities (Redaktion … 1985: 41 ff.). It seems that the dragon in science fiction literature has for the most part lost its magic and threatening character; it occasionally has been converted into a domesticated animal which, as it is tamed and controlled, can be utilized like a flying horse due to its enormous power and its ability to fly attacks against one’s enemies (e.g. McCaffrey 1981; Vance 1986). The degeneration of the dragon in science fiction stories in comparison to the ancient mythological figure seems to parallel the discrepancy between the horses of the horsemen of the apocalypse and brewery horses to quite an extent; like horses dragons are tamed and breeded; the passion is gone. management itself "is no place for fairy tales" (cf. 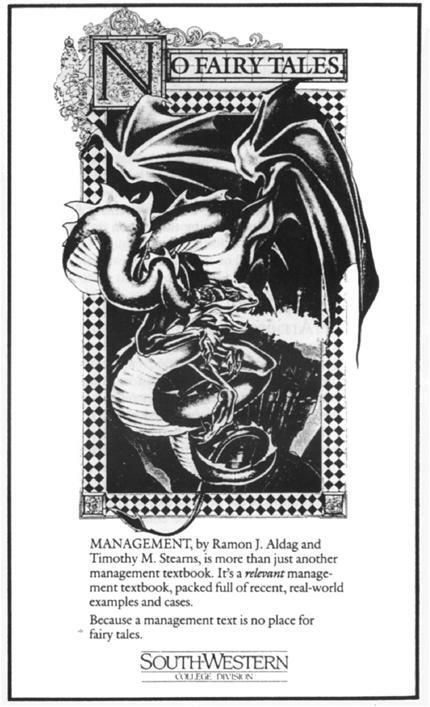 the advertisement for a recent book on management by South-Western using the dragon image). 4. The dragon as a symbol for corporate identity: Avantgarde or arrieregarde? As already mentioned above, it was a deliberate decision to take the image of the dragon for the SCOS-logo without the often related image of the hero or the knight. The designer actually was asked by P.O.Berg "to let the dragon tear down the organization chart that was trapping it" (Berg 1987a). Underlying this image is obviously quite a different notion of corporate culture than the one propagated e.g. by Deal and Kennedy (1982): "For an organization you’ll need heros; if you don’t have them create them!" Such a trivialization of the hero would, as I assume, ultimately lead to a trivialization of the dragon – and the concept of culture. It seems to me to be important that we as SCOS-members collectively try to find out what such a new version of the dragon could mean and represent for us if we were prepared to give it more significance than just a trademark – which some people wear on their shirts in form of a crocodile. As the SCOS-dragon obviously is supposed to have another relevance than just to discriminate its members from those who in their respective organizations wear a lion or an eagle on their ties or banners, it seems important to discover its particular meaning through a comparison of its similarities and differences with other dragon images. In my own first attempt to relate the SCOS-logo to other more traditional dragon images I found the considerations about avantgarde and tradition/arrieregarde quite helpful which Bazon Brock (1986: 102 ff. ), a colleague of mine, developed in his theory of art. The widespread understanding of avantgarde is that of a total break with every tradition and the creation of the absolutely new, alternative and unfamiliar, which then often enough either leads to the consequence that such a piece of art is either regarded as meaningless and gimmick or that the artist himself becomes the object of irony and aggression. Brock’s perspective, however, is quite different; he is convinced that we only recognize something as avantgarde which forces us to build new traditions. "Traditions" as he states it, "are nothing other than those comprehensions about the relationship of historical events which result from the respective contemporaries‘ attempts to look backwards" (Brock 1986: 105). Unlike the usual understanding of tradition as a force coming out of history which then influences the respective present, Brock regards as tradition that which influences the social construction of historical events in the present in so far as these historical events are united as ‚history‘ through a new tradition. Without such a (re)integration of the new into history which – at least so far as the history of art is concerned – especially during the last centuries has been a history of the previously new or avantgarde, the avantgarde remains meaningless and falls into oblivion as soon as it is antiquated by the very next avantgarde. As in art, the function of the avantgarde in mythology or symbolism could be to look at the apparently assured interpretations of our ancestors from a different perspective, i.e. to recognize again as unknown and surprising what has been regarded as evident and familiar. To the extent that traditional myths and images have to be rediscovered or reinterpretated from newly created or shaped images, the new myth may also appear in another light. To create such a new tradition often enough means recognizing the social as well as the unconscious dimensions these images refer to and are built upon as parts of a common culture. This, for example, means that ancient images often carry latently, so to speak, more cristallized meaning than we are able to reactivate contemporarily or that we, in a non-conscious manner, are referring to earlier images; we may even quote from them without being aware of the fact or of its sources. In order to demonstrate more explicitly what I mean by it, I would like to start with an example which, in the present context, appears to be interesting, because it might contribute towards a better understanding of the SCOS-dragon. On my hunt for the dragon I found a picture of one of the adventures of Baron Münchhausen fighting the dragon in what appeared to me on first sight as quite a curious way of dragon slaughtering. Münchhausen, a German army officer of the 18. century, well known for his countless adventurous journeys, once killed a dragon in Nubia by sticking a cake made of pitch and poison on a long stick into the dragon’s throat. As soon as the monster had swallowed it, it burst into pieces with a terrible bang. Well, I thought, just another of those curious stories of Münchhausen like the one in which he pulled himself up by his own hair out of the swamp (cf. Watzlawick 1979) or akin to the one in which he rode on a cannon-ball. 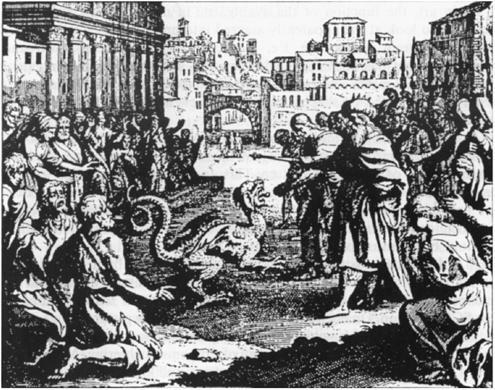 But only later, when I discovered another picture showing the ancient prophet Daniel killing a dragon in Babylon in the same manner, was I able to realize that the Münchhausen episode was a quotation which, as it may be assumed, may be even older than the dragon fight in the Daniel-Apocrypha. Referring to the biblical context (Dan. 14, 23-27; cf. Schmidt/Schmidt 1982: 41) the Münchhausen story received quite another meaning: stick into the dragon what it normally is supposed to spit out. And I made two similar discoveries in my attempt to look back on previous dragon images with the SCOS-logo in mind. One refers to the use of the dragon as a symbol for corporate identity, the other one is related to the combination of the dragon and the organization chart. As it was stated before, the fact that the dragon became a symbol of corporate identity is not new. 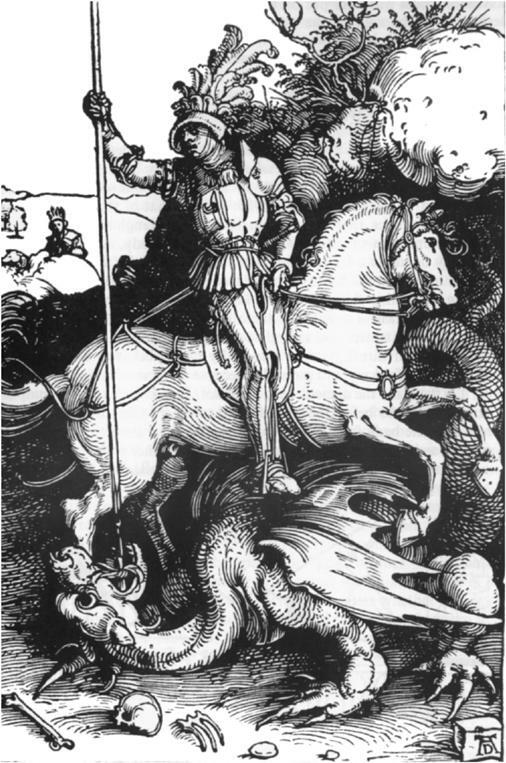 During previous centuries countless churches and many nations as well as cities have chosen either St. George or St. Michael, the dragon-fighters, as their patrons. And even earlier the Romans and the Vikings, among others, had chosen the dragon as a symbol which they carried in front of them on their various military and exploratory expeditions in order to scare their enemies as well as unknown demons. It seems that what later became a slogan of the crusaders referring to their cross, the "In this sign we shall conquer! ", originally refered to the dragon; for the Roman legionaries, for instance, the preservation of their dragon’s banner literally meant the survival of the legion. According to my understanding, we at SCOS, unlike the ancient Romans or the crusaders of the Middle Ages, are not preparing a military campaign; we are not propagating the endless war of growing economic and managerial successes. What the SCOS-logo in comparison to these contemporary myths seems to represent is an anti-myth. This anti-myth is based on the assumption that "the dragon is to symbolize the underlying, powerful, restless, collective aspects of the organization which, although we try to imprison them …, tend to break through, break out and ‚disturb‘ the smooth machinelike functioning of the corporate machine" (Berg 1987a). There can be no doubt that "the dragon itself is powerful, ruthless, determined – but not necessarily evil. It is people, who cannot stand things they cannot control, who see cruelty and viciousness in him" (ibid.). What the dragon in the SCOS-logo is supposed to symbolize for our contemporary institutions and our work enterprises, in particular, is a different metamyth from the glittering and sterile pseudo-reality as it is expressed in the best-selling soap operas on corporate culture and the related search for excellence. The dragon in this newly created version may get the previously explored function of the avantgarde in order to help us to create a new tradition of looking backwards to previous dragon myths and images in order to (re)discover that there may be other ways to cope with a dragon than just to annihilate it. It may even be the case that, by referring to the Chinese version of the dragon, we may discover new ways to help wisdom out of the wheel-chairs where it has been dislocated societally, in order to incorporate it in our organizations again (cf. Sievers 1986 a/b). The dragon tearing down the organization-chart may thus e.g. help us to perceive our history of industrialization from a new tradition, i.e. the repression and imprisonment of that part of reality which cannot be counted and measured. So far as the image of the "dragon breaking out of the corporate psychic prison" (Berg 1987a) in the SCOS-logo is concerned, I found two pictures which caught my thoughts and which may help on further attempts to perceive the mythology of this logo. The first one obviously is well-known; it is the front page of the first English edition of Thomas Hobbes‘ ‚Leviathan‘, which appeared in London in 1651. 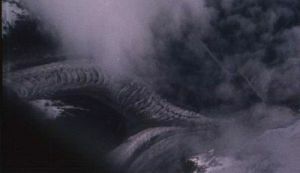 The Leviathan, in the Judaic tradition, is the cosmic dragon which along with his counterpart Behemot was created at the beginning of the world (cf. Steffen 1984: 83 f., 112 ff., 142 ff.). Althoug this cannot be the occasion to argue about the meaning and the possible failure of the Leviathan as a political symbol – a point which was extensively made by the German political philosopher Carl Schmitt (1982) in his book which first appeared in 1938 – what strikes me, if I compare the composition of this picture with that of the SCOS-logo, is the combination of the chaos symbolizing creature on the one and the hierarchical order of the state and the church on the other side. The similarity of the organigram and the dragon in the SCOS-logo is quite obvious! 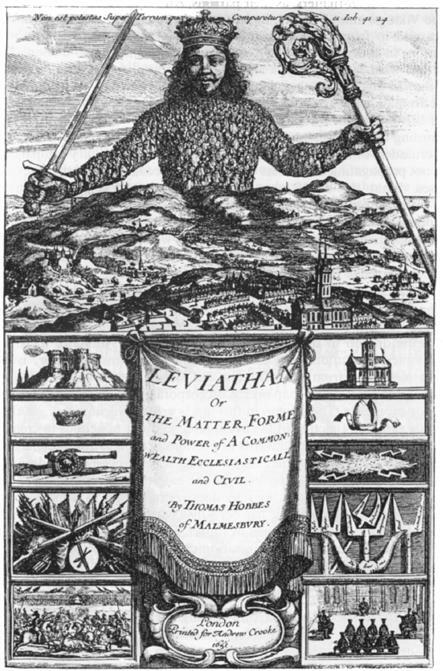 Whether Hobbes himself or Wenceslaus Hollar, the artist, who produced the engraving of the Leviathan in his commission knew the other picture I found, probably cannot be proved. It is a page from a Middle Ages codex of the rules of St. Benedict and shows God, the father, fishing for the Leviathan. 5. SCOS, the magic dragon: Pet or fundamental? The further exploration of the two Leviathan images which I happened to find on my way to the cave of the dragon may throw a new light on the SCOS-logo – probably not primarily through analogy but hopefully through a kind of playful creative exploration of our own cultural experience. Although I find it very encouraging that SCOS, with P. O. Berg’s help, has rediscovered the dragon and chosen it as its logo, I would like to repeat on this occasion a warning which P. O. Berg already expressed: "You cannot fool a dragon – he senses tricksters miles away. Dragons are not calmed or fooled by smooth talk or manipulation but cut right through the most essential (power) relationships and (emotional) experiences" (Berg 1987a). This warning in mind, it seems to me that, so far as the presentations to our SCOS conferences as well as the contributions to our journal are concerned, we have not seriously enough started not to fool the dragon; on occasions it appears to me that there are just still too many tricksters around and that the stories and images which are presented about the dragon, i.e. about ‚the ugly face‘ of our contemporary organizations, are far away from an attempt to elucidate where, how and to what an extent "our organizations are killing us" (Morgan 1986: 273). Much too often these contributions seem to repeat the title of one of the children books "There’s no such thing as a dragon" (Kent 1986). In order to let the dragon break out of the corporate psychic prison of our organizations, as it is indicated by the dragon tearing down the organization chart, a first step could be to indicate and to describe the traps and chains in which the dragon traditionally is caught in our organizations. What we as SCOS-members have been able to contribute so far, to a further understanding and conceptualization of culture, in general, and of corporate culture, in particular, reminds me in its predominant part of a comment George Steiner (1971: 34) once made referring to T.S.Eliot’s ‚Notes towards a definition of culture‘ which appeared shortly after the Second World War: "How, only three years after the event, after the publication to the world of facts and pictures that have, surely, altered our sense of the limits of human behaviour, was it possible to write a book on culture and say nothing." – If we are, however, prepared to discover in our "exercise in contemporary archaeolgy" (Berg 1987b: 25) the dragon traps as corporate artifacts, we have to acknowledge that the dragon, whose image we are projecting on others, lives in us (cf. Steffen 1984: 253 f.). It has to be recognized, accepted and cured by us before we will be able to discover it in the outer world of our organizations. Don’t let us forget that "a core element in the drawing", as Berg (1987a) states it, is "that the dragon should be fearful, i.e. scare the people experiencing him. Fear (of the uncertain, of lack of control, of the unknown, of death, of love – that could be lost -, of pain etc.) is probably one of the key emotions that build up the collective". Once upon a time there was a scholar reading in the upper floor of his house. It was a cloudy and rainy day and the weather was gloomy. Then he saw a little thing which was shining like a glow-worm. It was crawling on his desk. There, where it had been, it left behind burning tracks curved like the tracks of a rain­worm. It gradually twisted on to the book and the book, too, became black. He then realized that this could be a dragon. Therefore, he carried it on the book outside the door. He stood there for quite a while; but it remained seated, rolled up and did not move at all. Then the scholar said: "One shall not say of me that I was wanting in respect." With these words he carried the book back and laid it down again on the desk. Then he put on festive raiment, made a deep bow and escorted it outside. He was no sooner out of the door than he noticed that it raised its head and suddenly it extended. With a hissing sound it flew up from the book forming a shining stripe. It once again turned back to the scholar; by then its head was already as big as a barrel, and the size of its body measured nearly a cord. After another meandering a terrible thunder-clap crashed and the dragon went up into the air. Then the scholar went back and investigated which way the little creature had come. The tracks went to and fro as far as the bookcase (Chinesische Märchen 1961: 135 f.). McWhinney, W. (1987), Organizational evil: Faust, professionals and bureaucrats. Manuscript, Venice, Ca.